As we start the new year, we are thankful for the animals we have been able to help and we are grateful for our supporters! It is people like you that make it possible to vet, feed, house and find permanent homes for the dogs in our care. The phone rings every day with requests for help and there is always another emergency. We require funding to do this important work. 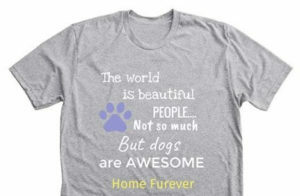 Won’t you please consider purchasing a T-shirt to assist in the life-saving work of Home Fur-Ever Rescue? Click here to place your order. For information on our adoption events, check our calendar and follow us on Facebook.